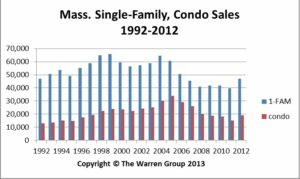 BOSTON, January 24, 2013 – Single-family home sales in Massachusetts rose 18 percent in 2012, marking 12 consecutive months of year-over-year sales gains and the best year on record since 2006, according to new data from The Warren Group, publisher of Banker & Tradesman. In all of 2012, home sales statewide rose more than 18 percent to 46,887, up from 39,594 home sales in 2011. This is the highest number of annual sales recorded statewide since 2006, when there were 50,724 sales. Single-family home sales statewide increased 8 percent to 3,688 last month, up from 3,410 in December 2011. Fourth quarter home sales also increased from a year ago. A total of 11,305 sales were recorded in the fourth quarter 2012, up 13 percent from 9,991 during the same period in 2011. The first quarter 2012 was the worst quarter of the year, posting 8,018 sales. Keeping with tradition, June and the third quarter were the strongest periods of the year, when 5,535 and 13,950 single-family properties traded hands, respectively. The median sale price of single-family homes statewide rose more than 12 percent in December to $300,000, up from $267,250 in December 2011. It’s the first time since August that median home prices broke the $300,000 mark, and the first December since 2007. Prices in the fourth quarter increased to $295,000, compared to $270,000 during the fourth quarter 2011. The median price for single-family homes inched up 1.8 percent to $290,000 in 2012, up from $285,000 in 2011. A total of 1,617 single-family home sales were of bank-owned properties – representing 3.4 percent of all single-family sales in 2012. That’s down from 2011, when bank-owned properties accounted for 3.8 percent of all single-family home sales in Massachusetts. 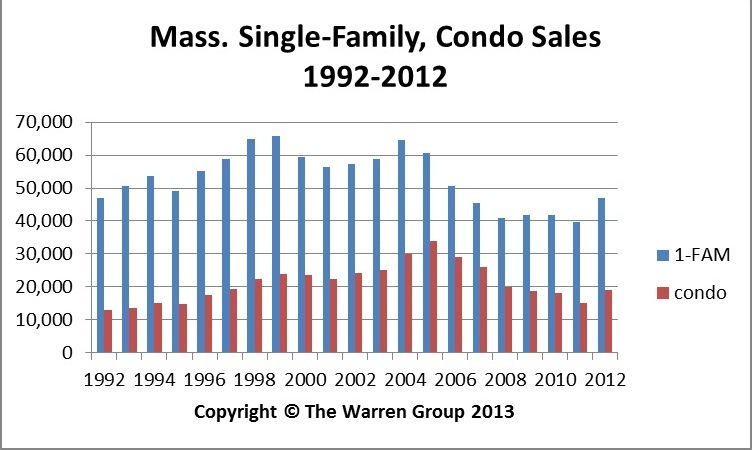 Condominium sales also increased in 2012, rising more than 25 percent to 19,061 from 15,191 in all of 2011. This is the highest number of condo sales statewide since 2008, when there were 20,109 transactions. Condo sales also climbed in December, rising 5.4 percent to 1,402 from 1,330 in December 2011. Fourth quarter condo sales increased almost 21 percent to 4,391 from 3,639 during the same period in 2011. The median condo price in December rose 8 percent to $275,000 from $254,000 in December 2011. The year-to-date median condo price rose 2.6 percent to $277,000 from $270,000 in 2011. Median prices increased more than 7 percent in the fourth quarter to $274,500, up from $255,000 a year earlier. A total of 492 condominium sales were of bank-owned properties – representing 2.6 percent of all condominium sales in 2012. That’s down from 2011, when bank-owned condo sales represented 3.5 percent of all condo sales.